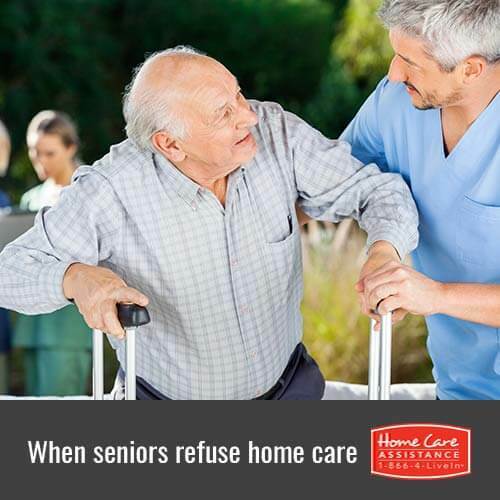 What If My Elderly Relative Refuses Home Care? Home care offers a variety of services to ensure your parent’s wellbeing, yet it is common for elderly adults to refuse help at first. Although this can be frustrating, it is important to remain calm and continue using the following strategies to help him or her understand the benefits that are provided by an in-home caregiver. Many elderly adults refuse assistance at home because they are concerned it means losing their independence. Begin by suggesting hiring a Toronto caregiver who can tackle a dreaded chore such as preparing meals. Once your parent realizes the freedom this can bring, he or she will be more likely to accept additional help. When refusing home care compromises physical health, it is necessary to act quickly. If your parent has a strong rapport with his or her physician or nurses, asking them to recommend home care and stress its importance to your parent can help change his or her mind. Independent seniors may feel as though they can manage their daily routine perfectly fine, yet loneliness is still a common concern. Suggest having an in-home companion stop by a few times a week to provide some conversation and stimulating activities. Listing all of your elderly parent’s struggles will only lead to denial and anger. Instead, appeal to your parent’s desire to know you are happy by explaining that Toronto senior care would provide you with peace of mind. The realization that you are acting out of concern can encourage your parent to consider the emotional benefits of home care. Scheduling an initial visit can alleviate negative opinions regarding home care. During this visit, your parent can talk to a potential caregiver who will explain how their assistance can promote independence as well as the Care Manager who will be overseeing all care services. Once your loved one has met the caregiver, suggest a trial run during which he or she can decide upon the services included in the care plan, like grocery shopping, medication reminders, transportation assistance, and light housekeeping. Learn more about in-home senior care for your loved one from the dedicated staff at Home Care Assistance. Although we are known for our flexible hourly and live-in care, we also offer comprehensive Alzheimer’s, dementia, Parkinson’s, and post-stroke care in Toronto. For more information, please call our office at (416) 488-8777 and schedule a complimentary in-home consultation.